One of the great pleasures working in Outreach Services is getting to know our colleagues. We are passionate about serving our communities, finding the resources we need to succeed, and information sharing. With great esteem, I would like to present the 2019 ABOS Board of Directors. Thank you to those who ran in the election. I would also like to thank the 2018 ABOS Board and committee members for their hard work and dedication. We achieved all of the goals we set out to accomplish and took steps forward. Below is an overview of the election results and 2018 year in ABOS. CONGRATULATIONS! Results of the 2019 Official ABOS Board of Directors Election. Tina worked with board members’ strengths and weaknesses. The importance of communication was stressed throughout the year and the board was oriented to the technology tools to help the communication process: Google Docs, email, UberConference, and cell phone numbers. Committees were led by a board member chair and set and accomplished annual goals. ABOS reconnected with ALA-ODLOS and ARSL. We had a successful conference with 259 attendees and eleven vendors - a higher number in attendance and more vendor support than previously achieved. Thank you to Matthews Specialty Vehicles, Thorndike Press, Farber Specialty Vehicles, Summit Bodyworks Specialty Vehicles, and Winnebago for their extra conference event and attendee supplies support. Kris Ringwalt, Board Member-At-Large, worked with the committee members to seek and welcome new members. As of November, we have 307 members. We welcomed 24 ALA Spectrum Scholars to ABOS. David Kelsey, Treasurer, reported positive changes in organizing the billing and tax cycles and paperwork. David worked with Past Treasurer Brooke Bahnsen to write our procedures and create detailed reports that will benefit future board members. David created, along with the Board, a conservative budget that was held to and we surpassed income expectations. David also worked with the committees on fundraising and grant writing efforts. Kim McNeil-Capers, Board Member-At-Large, worked with the committee members on getting the word out about ABOS via social media and identifying periodicals/magazines that accept article submissions to further promote outreach and ABOS. The committee worked with ALA-ODLOS on celebrating National Bookmobile Day. Susan Parkins, Vice President, worked with the committee in working ahead in securing future conference locations that met the budget and needs of ABOS. 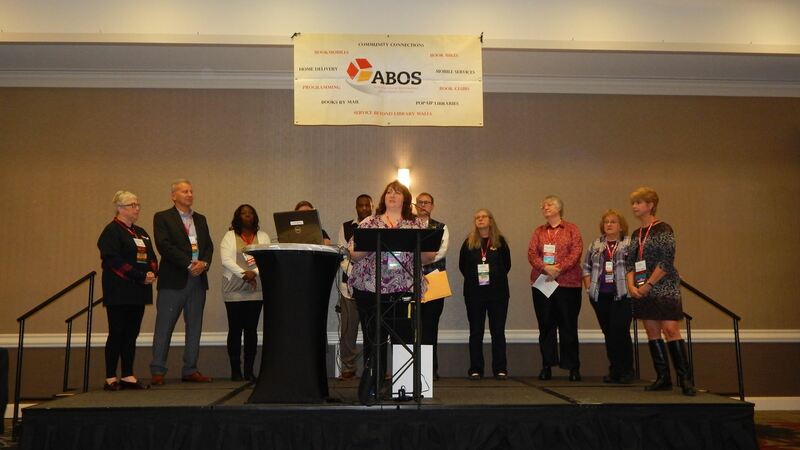 The 2019 ABOS Conference will be held in Omaha, Nebraska and the 2020 ABOS Conference will be held in Dallas, Texas. Lori Berezovsky, Secretary, worked with the committee on creating the new Out and About newsletter, and chose merchandise to sell at the conference based on last year’s survey results. Our sales at the conference were a great success this year! Our Marketing Committee worked hard on merchandise for the annual conference and the creation of an online newsletter. Ann Plazek, Past President, worked with committee members in finding and encouraging strong candidates to run for the ABOS Board. Brock Hutchison, Board Member-At-Large, highlighted the work of the committee concerning the ABOS website crash, recovery, and launch of the new website. The committee does not consist of technology people, but their teamwork, skills, and vast thirst for knowledge and resources created a strong ability to succeed. Brock Hutchison, Board Member-At-Large, annual goal for the awards committee was to increase the number of award applications. The committee contacted every state library and all library schools to get the word out about awards. As a result, the committee received a large number of good applicants. The importance of the John Philip’s Award was discussed, the name was changed to the John Philip Excellence in Outreach Award Winner and the winner received a plaque with a one-year ABOS membership. Thank you to our vendor, Acore Shelving, for supporting the Carole Hole Awards and to Farber Specialty Vehicles for supporting the John Philip Award. 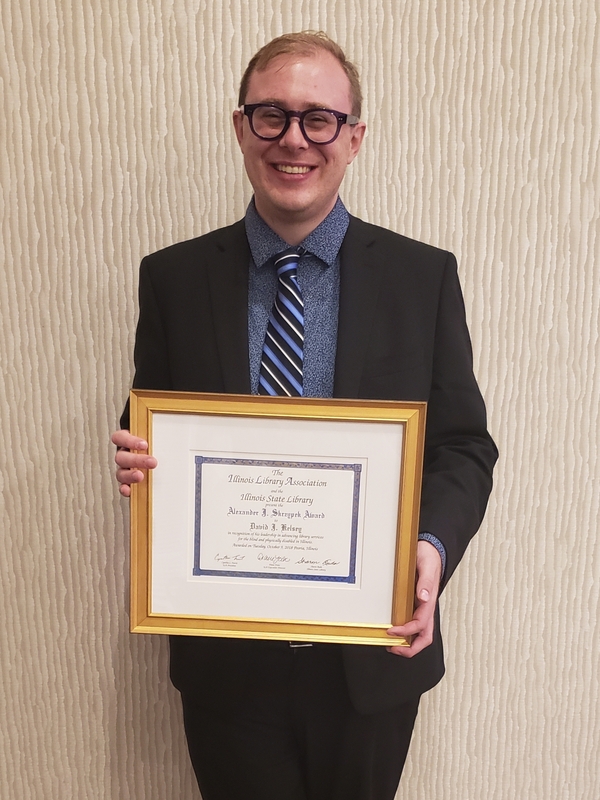 David Kelsey (2018-2019 ABOS Treasurer) was the recipient of the Illinois Library Association’s 2018 Alexander J. Skrzypek Award. The award is given to a person who has made “an outstanding contribution to the advancement of library services for the blind or physically disabled in Illinois.” David accepted the Alexander J. Skrzypek Award at the Illinois Library Association’s 2018 Annual Conference in Peoria, Illinois on Tuesday, October 9. This fall ABOS will be electing a new board! Interested in joining the team? Click here. Kim McNeil-Capers (ABOS Executive Board Member) was the 2018 Advocacy Award recipient for the third National Joint Conference of Librarians of Color (JCLC) this week at the Albuquerque Convention Center in New Mexico which celebrated the achievements of individuals from each of the American Library Association's ethnic affiliate associations. Sponsored by the five ethnic affiliates, the conference was highlighted by the JCLC 2018 Scholarships and Awards GALA on September 28, 2018. Kim McNeil-Capers received the BCALA Advocacy Award which recognizes demonstrated commitment in support of library and information services to the profession and/or community of users. 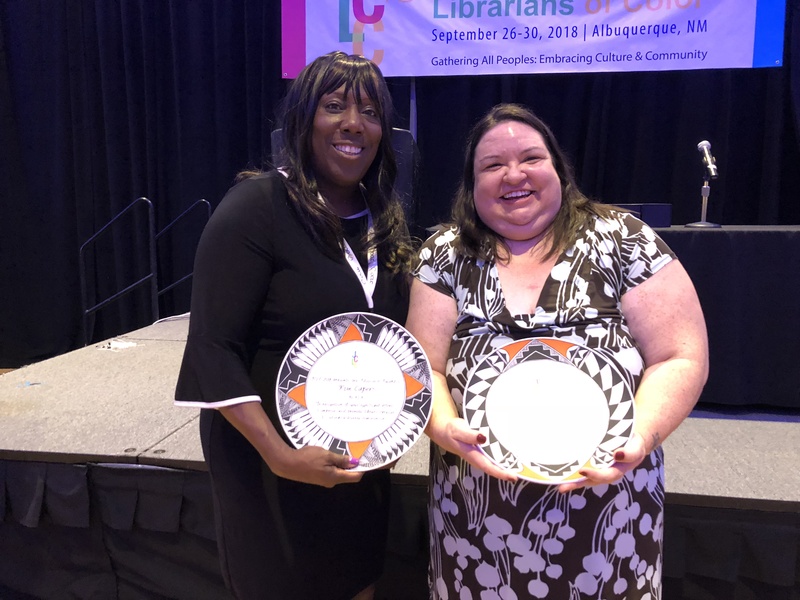 who received the Distinguished Service Award honors at The third National Joint Conference of Librarians of Color (JCLC) this week. Join Giving Assistant to have a portion of your online purchase given back to ABOS! 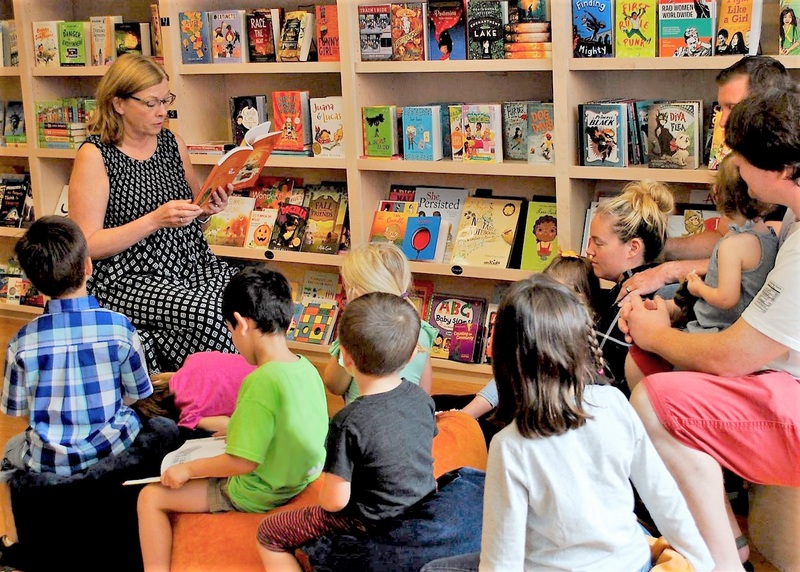 Help us to celebrate National Bookmobile Day (Wednesday, April 11, 2018) during National Library Week. Flood social media with your photos and LOVE for bookmobiles and outreach. If you see someone else's post, share it!